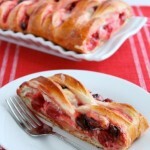 Upside-Down Cranberry Orange Rolls - Dessert Now, Dinner Later! 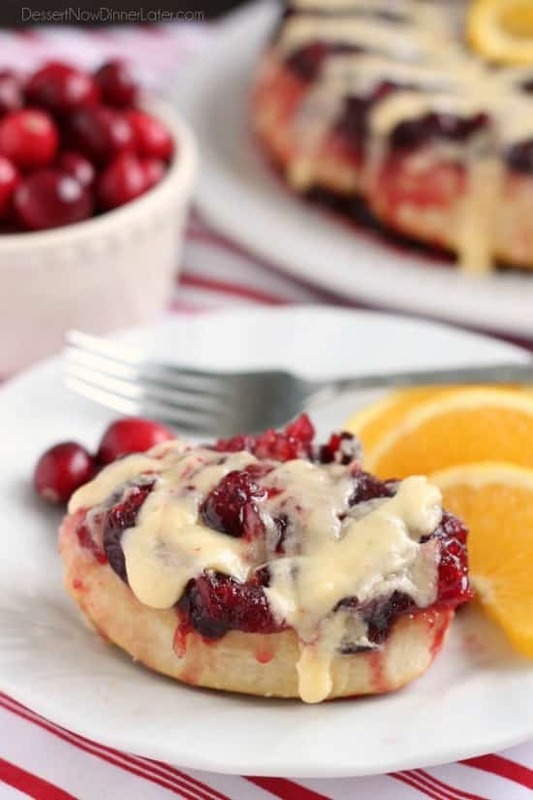 Frozen orange rolls are baked atop fresh cranberry sauce, inverted onto a dish, and drizzled with a delicious orange cream cheese glaze for a Christmas breakfast worth sharing with family and friends. Cranberry has been on of those flavors that I’ve grown an acquired taste for as I’ve gotten older. I love cranberry juice, but cranberry sauce at holiday dinners hasn’t been my favorite until I’ve made it fresh myself. There’s something that makes me gag about canned cranberry sauce that you can slice. I don’t know, my husband loves it, but I just can’t get on board. Anyway, I have started using fresh cranberries in recipes the last couple of years and I’m a big fan. My absolute favorite holiday dish with cranberries is this Cranberry Salsa that you serve over cream cheese and eat with crackers. It’s the perfect blend of spicy, sweet, and cool. I’m also a huge fan of Cran-Apple Crisp because, who doesn’t love apple crisp? The cranberries add a nice tart element to balance out the sweet apples. It’s just heavenly with a scoop of vanilla bean ice cream! Yum! 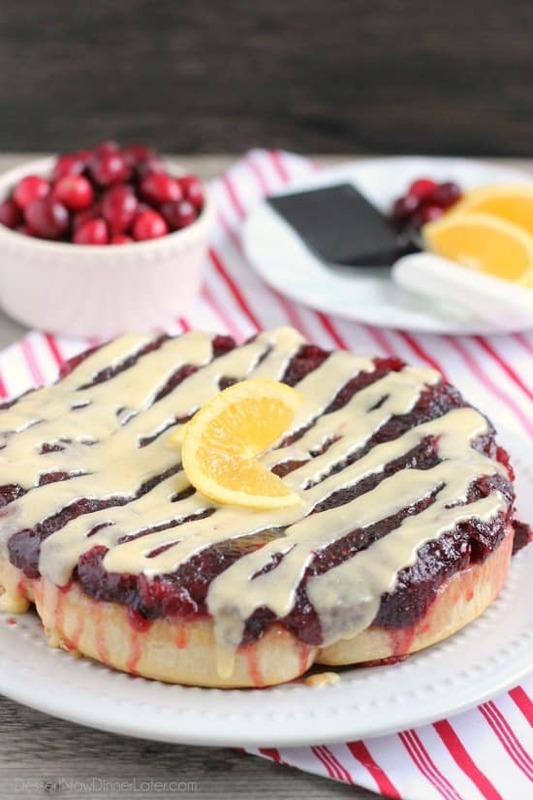 And then there’s the classic cranberry-orange combo! 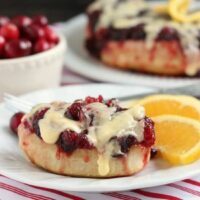 I made Cranberry Orange Muffins last year, and I think I like these rolls even more. Nothing shouts Christmas breakfast like cinnamon rolls, but these are more merry because they are red. The homemade cranberry sauce is so quick to whip up and super delicious! 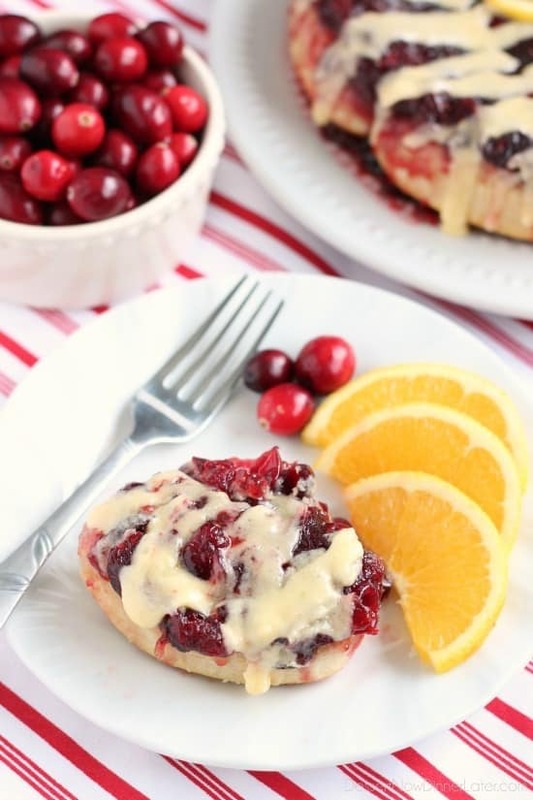 These Upside-Down Cranberry Orange Rolls are a great option for serving your holiday guests. 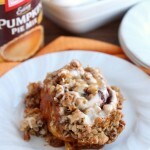 And let’s be honest, orange rolls can totally be dessert too! Yum-o! Did I mention you don’t even have to make the rolls and icing? Well, get excited! Rhodes makes it super easy with their AnyTime Orange Rolls! 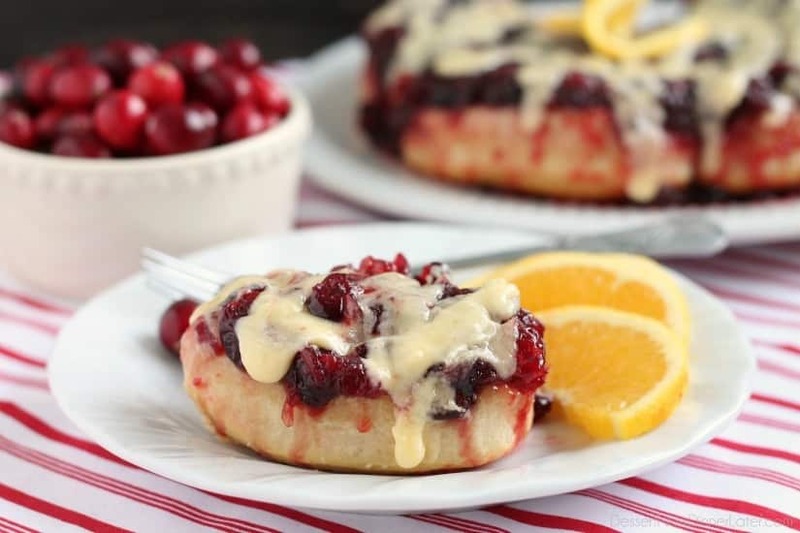 Grab the full recipe and tutorial from the Rhodes blog and enjoy the holidays with these festive Cranberry Orange Rolls! Recipe added 5/26/16. For a step-by-step photo tutorial, visit the Rhodes Bake-N-Serv Blog. 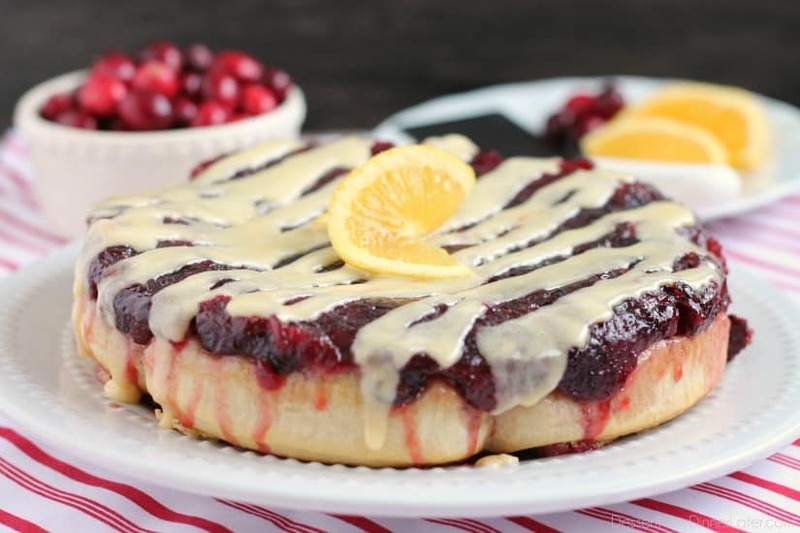 Melt the butter with the brown sugar, orange zest, and fresh/frozen cranberries in a medium saucepan. Simmer until the berries burst and the mixture thickens, stirring occasionally; about 5 to 7 minutes. Remove from heat and mix in the dried cranberries. Allow to cool slightly (2 to 3 minutes). Remove the orange rolls from the foil pan and pour the cranberry sauce into the bottom. Place the orange rolls on top of the cranberry sauce and place the pan in a 350 degrees Fahrenheit oven. Bake for 30 minutes or until golden brown and baked through completely. Immediately invert the foil pan onto a large plate. 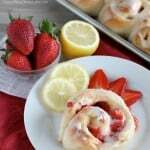 Allow rolls to cool slightly before adding the frosting so it doesn't melt off completely. Warm the cream cheese packet (that came with the rolls) with your hands and drizzle it over the top of the rolls. Serve immediately. Refrigerate any leftovers in an airtight container up to 5 days. Wow, Amber, these look so amazing. I’d like to gobble all of them up right now! Thanks Teresa! They were fun to photograph because they are so vibrant. These rolls are everything! I am a sucker for orange and cranberry! They were ridiculously delicious! Thanks Jen! 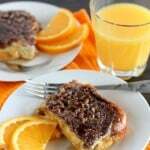 What would you use if you can’t find the frozen orange rolls- how well would it work with refrigderator rolls?